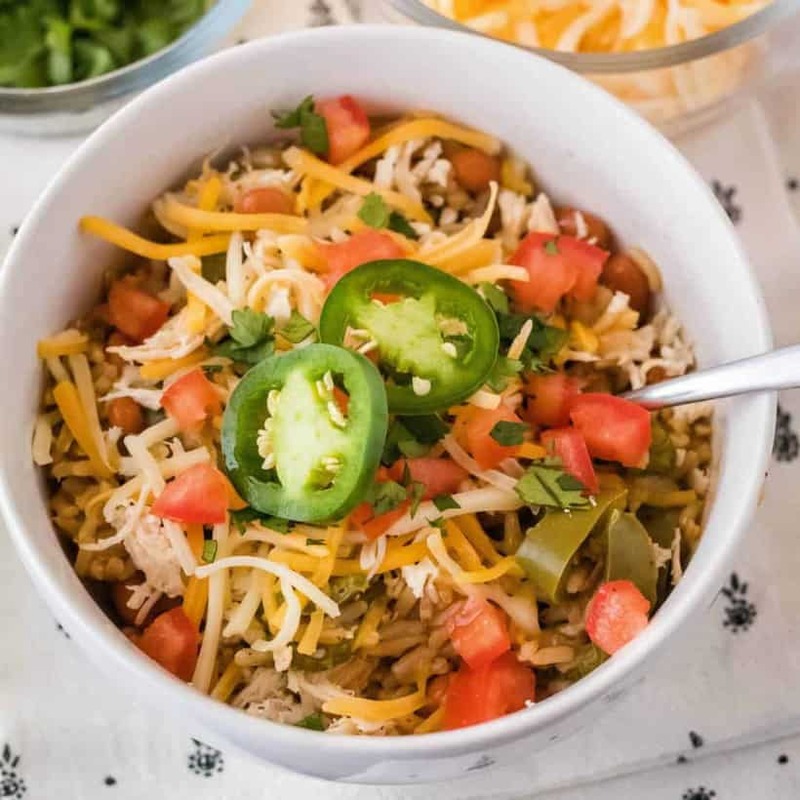 Get dinner on the table in 35 minutes with this healthy Instant Pot Fajita Burrito Bowl recipe! Super easy to make & customize with your favorite toppings! I’m a Mexican food addict. Mike and I get lunch at one of our favorite Mexican food or taco spot at least once a week. It’s the best! 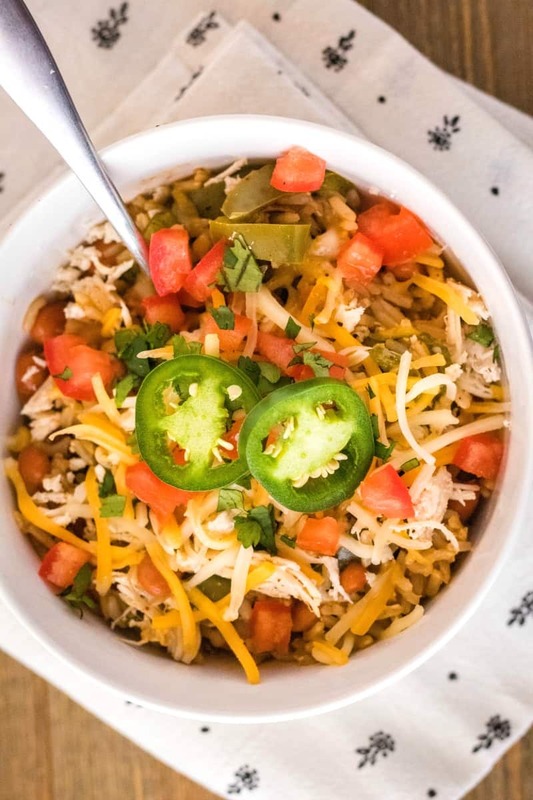 And so is this Instant Pot Fajita Burrito Bowl. Ready in about 35 minutes, it’s a healthy weeknight meal you can feel good about serving up. And as much as I love crock pot recipes, my Instant Pot has dinner on the table in a jiffy! I’m not the best about making healthy meals on the regular. I have good intentions, but pasta and creamy sauces are my weakness next to bacon. That’s why I’m so happy about Healthy Eating One-Pot Cookbook by Lauren Keating from Healthy Delicious to help get us back on track. It may sound silly but my favorite thing about this cookbook is that it has real cooking times and your vessel is noted at the top of the page! Slow cooker recipes have a little icon in the top right of the recipe page and it tells you “Slow Cooker” and so forth. But better yet, the Instant Pot recipes have prep time, pressurizing time, cooking time, and release time noted! No guessing about how long pressurizing is going to take while the family stares at you like you haven’t fed them in a week. Amazing! Mike and I have a list of dishes we’re eager to try from this cookbook. 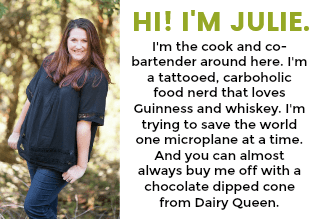 These recipes are delicious and I can tweak them to match our eating preferences. Take this Fajita Burrito Bowl for example. Mike and I are full on omnivores and like our meat, so we added some shredded chicken to our healthy burrito bowl. But you totally don’t have to do that. Prepare this recipe as is from the cookbook for a Meatless Monday option. Mike doesn’t care for cilantro, but I like it. Boom! 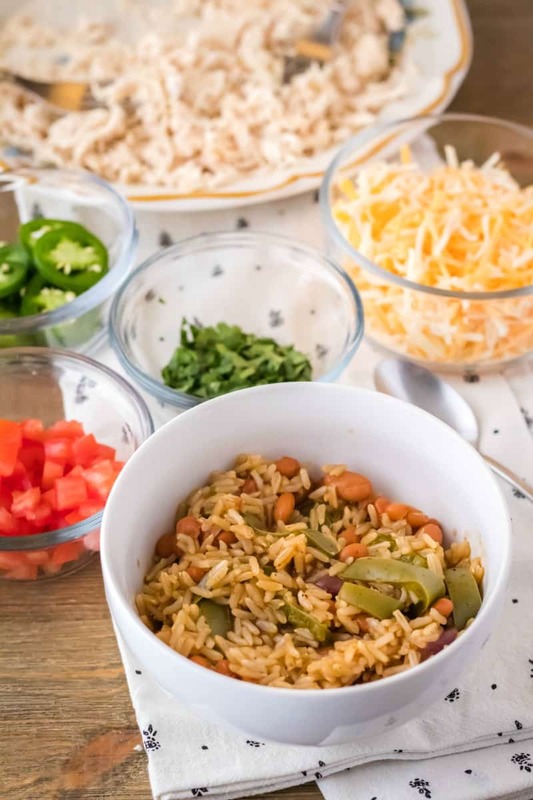 Serve dinner as a burrito bowl bar so everyone can add their favorite toppings. We also wanted a kick of spice and a little of our favorite hot sauce mixed in was just the ticket. Don’t’ be afraid to make this recipe your own! 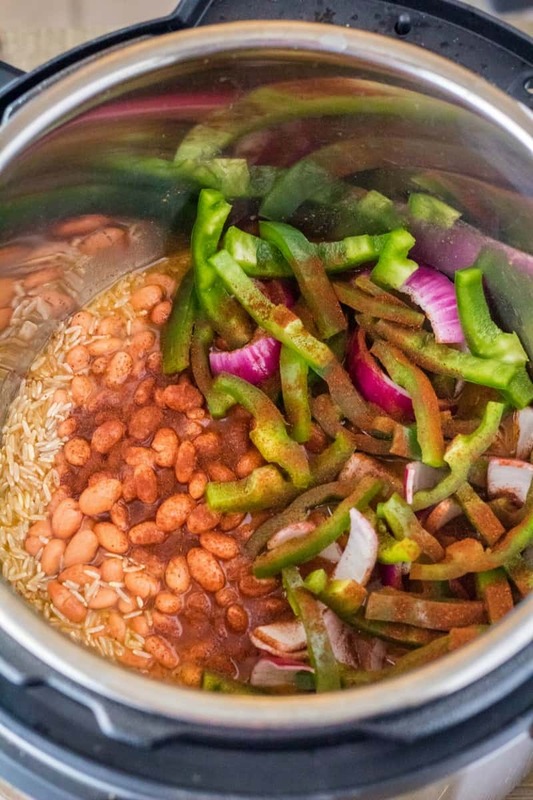 Add rice, pinto beans, vegetable stock, sliced green bell pepper, sliced red onion, and chili powder to Instant Pot. Cover and seal. Cook on High pressure for 15 minutes. Naturally release pressure. Stir and then portion into 4 bowls. Top with desired mix-ins. I think one of my favorite things about this burrito bowl recipe besides the flavor was how crazy easy it was to make. I cooked our chicken in the Instant Pot before starting the rice and beans. I prepped the toppings while the rice cooked, and after that the chicken got shredded. It only added an extra 25 minutes to our routine and that’s for FROZEN chicken people. That being said you could absolutely use a rotisseries chicken from the store or leftover chicken from the night before to cut down on prep time. 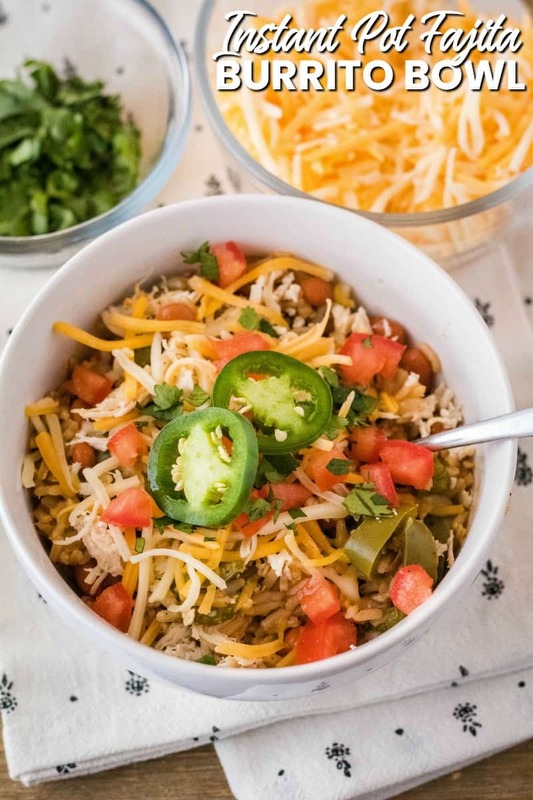 This chicken burrito bowl is really great for lunch and meal prep too. 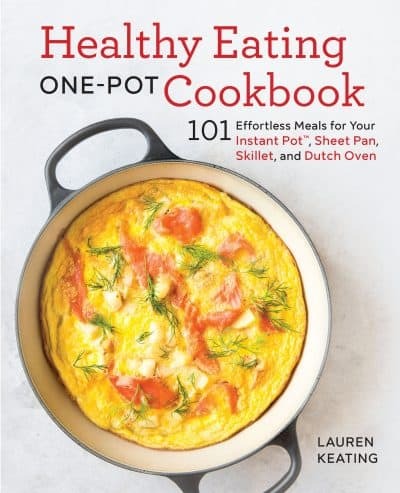 So grab a copy of Lauren’s cookbook and get eating! 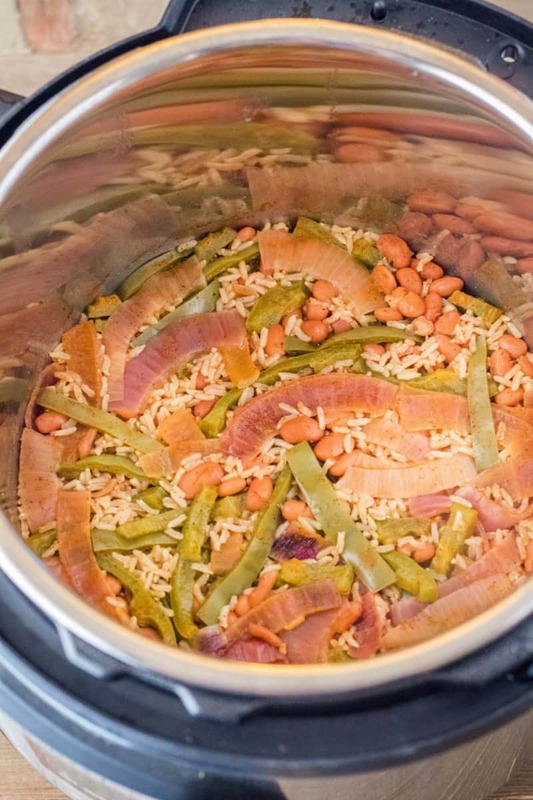 Add brown rice, pinto beans, vegetable stocks, bell peppers, onion, and chili powder to your Instant Pot. Cover, lock the lid, set vent to sealing, and set the cooker to High (manual) pressure for 15 minutes. When the cooking time ends, turn off Instant Pot and let naturally release for 5 minutes. Open vent for quick release until lid unlocks. You can leave out the chicken this recipe for a vegetarian meal. I cooked my chicken in the Instant Pot before starting the fajita bowls but you could totally use rotisserie chicken or leftover chicken from the night before. Add 2 frozen chicken breast to the Instant Pot with 1/3 cup chicken broth and 1/2 teaspoon minced garlic. Cover and close lid, vent on sealing, and cook on poultry setting for 10 minutes. Naturally release for 5 minutes and then quick release if needed. Remove from pot and shred.